Kāneiolouma translates as Kane‐who‐drove‐and‐pushed. The Kahua O Kāneiolouma (Kāneiolouma Complex) and agricultural site complex is part of a huge complex of agricultural and habitation sites ranging from Kōloa town to the coast of Poʻipū and ranging from the Weliweli area westward to Kukuiʻula Bay. Most of the es?mated 1000+ features have been destroyed. Currently under the jurisdiction of the County of Kauaʻi and known as the Poʻipū Beach Park Mauka Preserve, the stewardship group Hui Malama O Kāneiolouma is cooperating with the County to clear, maintain and rehabilitate this complex as a public cultural preserve. There are three components to this complex: religion, agriculture and aquaculture (fish ponds). The Kāneiolouma had three main sections. On the East side there is a large sports arena where Hawaiian games such as fore‐arm wrestling (uma), wrestling (hakoko) and deadly grappling (lua) were carried on. On the south side there is a large fishpond where special fish intended only for the alii were raised. The Waiohai spring is the center of this fishpond. Extensive walled enclosures, alters, numerous bases for temple images, shrines, taro patches, irrigation ditches, a series of large fishponds, house platforms, extensive cooking areas, and terracing. The County of Kauai’s Poʻipū Beach Park has consistently been recognized as one of our Nations most beautiful beaches. 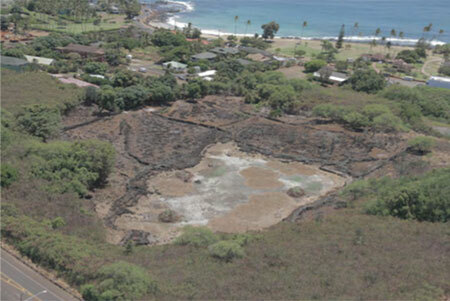 The Kāneiolouma Heiau complex is a component of Poʻipū Beach Park and by preserving and enhancing both elements, the County of Kauai is enriching its world class destination. Yet, perhaps more important to us as an island, is a sense of pride that our unique cultural heritage is preserved in perpetuity.